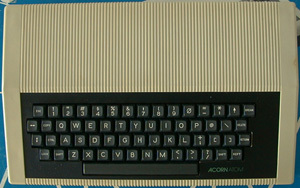 Acorn entered the emerging home computer market with a consumer version of their Systems 2 to 4A. By integrating the basics of these systems onto one board and placing it in the keyboard, the Atom was born. The Atom measures 15" long x 9.5"deep x 2.5" high. It contains a full sized keyboard laid out in the conventional typewriter way, the full travel, light pressure keys give a positive reliable action. The Atom is ready to use with any color or monochrome tv, or with a simple modification can be used with a video monitor. Colour output is built-in for use with a monitor; the PAL encoder is required for use with colour tv. The minimum Atom has initial 2K of RAM and 8K of ROM which can be increased to 12K of RAM and 12K of ROM. BASIC and ASSEMBLER (machine code), graphics and sound output, and direct cassette and TV interfaces are standard features. 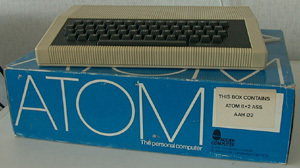 The Atom is based on the 6502 processor and a 6847 VDU chip. 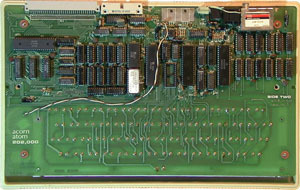 The 6847 is similar to the then popular 6845 CRT controller, but with more functionality on board. The trade off is flexibility. For various IO an 8255 PPI is used. As an option, a 6522 VIA could be installed, which gave Centronics printer support and hardware timers. The basic Atom has an 8KByte integer BASIC. A 4KByte floating point extension is an option, as were various utilities. In this Atom a "TOOLKIT" is present. 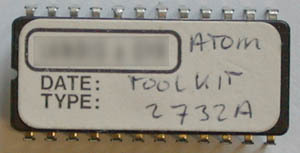 No company name in the EPROM or in the documentation, but probably from "Willow Software". No problem having my software online. I should have put some identification in the ROM, but there was not much room left! It was written in assembly language, using a cross-assembler on a big Prime mainframe. I did it mostly to learn about the Atom, the 6502, and to learn assembly language which I have been teaching since then, at a university, for over 20 years. I built my own EPROM programmer to program the ROMs. I never made any money from it, mainly due to the high cost of the EPROMs and the cost of advertising. It was also quite a small customer base. Despite its limitations, the Atom, was a wonderful little computer, a great educational tool, and good fun. It helped to establish me in my career as a lecturer in digital electronics and microprocessors. Another option was the disk interface. As it was twice the price of a Atom, these units were not very widespread. The basic Atom created a monochrome display. The PAL encoder unit allowed it to create a colour image on TV (color monitors were very expensive then). 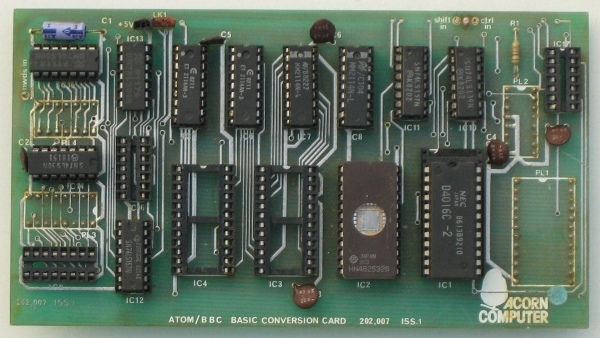 The ultimate expansion was the ATOM/BBC basic board, which added the Basic and the option for more ROMs to the Atom. 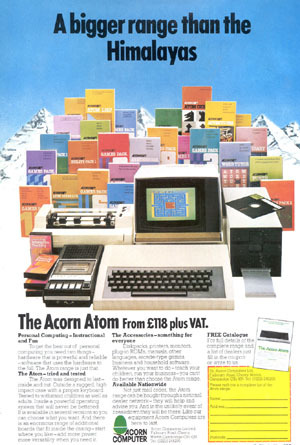 The Dutch Acorn Atom User Group developed a system that upgraded the Atom to almost the BBC level. 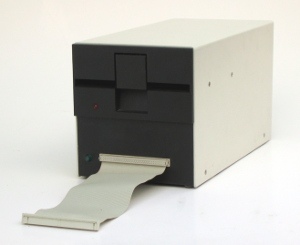 The hard-to-get Disk controller was replaced by a CP/M card which emulated the original FDC. With an additional 80 column card, CP/M operation was complete. More on this at ATOM review (in Dutch) and English. A beginners guide in BASIC and machine code programming. As no company is claiming the ATOM heritage, I expect no problems with publishing the ATOM manual here. If there are, let me know. A nice advertisement in Practical Computing October 1982. Description of Atom and some Dutch made extensions. 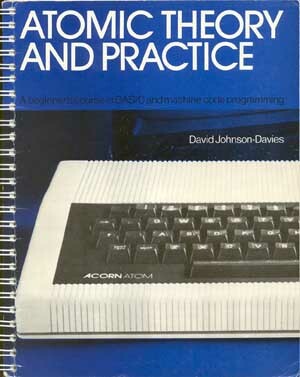 Interview Chris Curry - One of the founders of Acorn - Practical Computing October 1982. 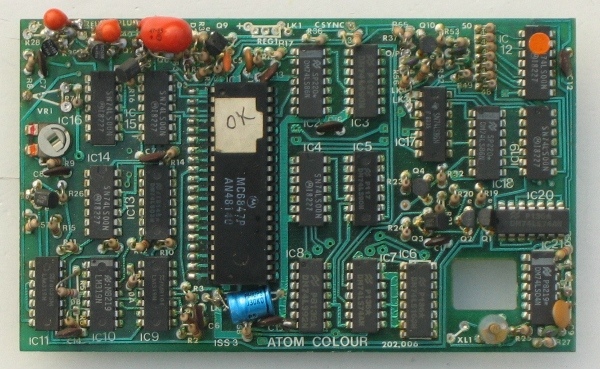 The BBC Micro Documentation project has something on Atoms too. RISCOS Ltd. and element14 are decendants of the late Acorn Computer Ltd. Don't bother to look for Atom or even BBC info. Element14 is still D.I.Y community oriented.